On February 20-21, 2018, the National Religious Retirement Office (NRRO) offered Moments of Grace, a workshop to help congregational leaders provide care and assistance for members with dementia. The gathering attracted more than 70 participants from some 35 religious communities across the United States. Attendees explored practical approaches for creating physically, emotionally, and spiritually supportive environments for those with dementia and those who care for them. The February gathering marked the third time the NRRO has offered this popular workshop. Previously, participants have commented on the value of the information provided. “This type of workshop is so important and necessary,” wrote one participant. Other than registration fees and travel expenses, all costs for the workshop were underwritten by the NRRO. Each year, a portion of the proceeds from the annual Retirement Fund for Religious collection is allocated for educational programming. Workshops, webinars, publications and other resources are aimed at helping religious communities plan for long-term retirement needs and enhance care for elder members. 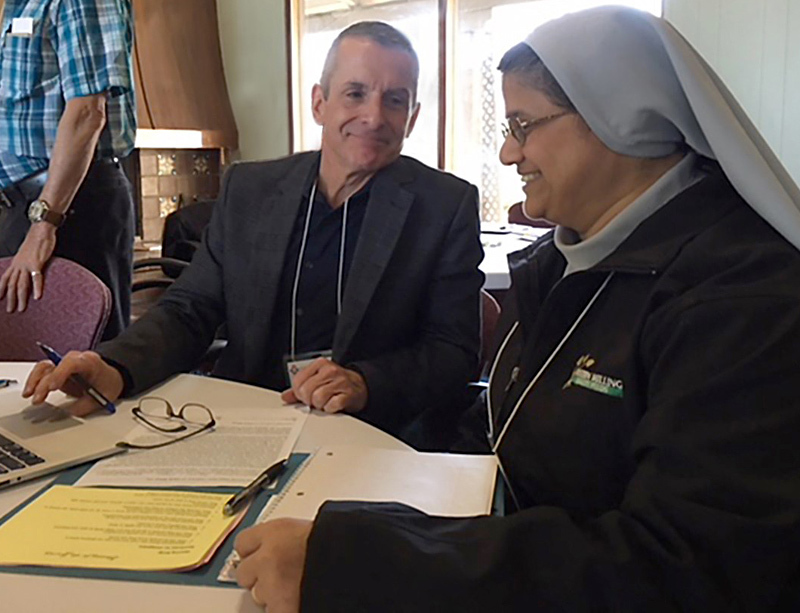 Pictured above (from left): Mr. Dan Flynn, who works with the Congregation of the Passion, speaks with Franciscan Hospitaller Sister Astrida D’Cruz during the workshop.